Life on the road, whether it’s full time or strictly vacation, has it’s fair share of unexpected obstacles. Incidences that may otherwise set you back financially can be fixed quickly and easily with having protection from RV insurance and extended RV warranties. In this blog, we will discuss the advantages of having RV insurance and extended RV warranties, the differences between the two, and why it is important to have both. A big difference between the two is that it is required to carry insurance on an RV, while having an RV extended warranty is an additional form of protection. RV insurance and RV extended warranties mainly differ on what they cover. An RV insurance policy can cover damages caused by collisions or other sources such as weather, vandalism, falling objects, etc. It can also assist with medical bills from accidents. In comparison to RV insurance, RV extended warranties cover components in your coach unrelated to an accident or incident. Instead, an extended warranty can help cover costs of failed mechanical parts, many of which are known to have high repair costs. Items such as engine, transmission, refrigerator, generator, slide outs, and many more are examples of what can be covered under a typical extended warranty. There is not much arguing when it comes to having insurance, but for extended warranties, they can often be viewed as a luxury or “peace of mind” purchase. Similar to the risk of driving your RV without insurance, RVing without an extended warranty is rolling the dice against suffering a high-cost mechanical breakdown. Common failures such as transmission breakdowns cost upwards of $12,000 to repair, with refrigerators at over $3,500 and engines at a gut-wrenching $30,000+. The price of a policy and deductible on a repair is microscopic in comparison to the high dollar cost of parts and labor that so many RVs will require. Within the confines of the extended service contract, otherwise known as an RV extended warranty, repairs ranging from small to large can be covered at a much lower cost with a warranty, and in the end, giving you the means to have less stress on your RV travels. We know that you are most likely required to have RV Insurance by law, so why couple that with RV Warranty protection? The ultimate peace of mind. With your RV insurance ready to take on any damage that arises from accidents or weather, and an RV warranty designed to take care of the ever-increasing cost of mechanical RV repairs, you will have room in your budget to do what you do best: travel! RV extended warranties are the perfect companion to your required comp and collision insurance, because RVs can and will breakdown at any time. In fact, 3 out of every 10 RVs suffer a major breakdown in only their 2nd year on the road, and this jumps to nearly every RV by their 8th. RV Insurance won’t cover your failed leveling system, broken refrigerator, or costly generator–but with RV warranty coverage, you won’t have to worry when these mechanical breakdowns arise. We hope to have shed some light on some of the mysteries surrounding RV extended warranties and why they make for a great companion to an RV insurance policy. 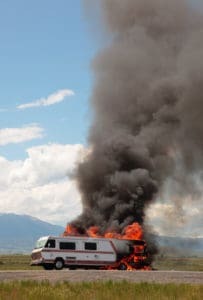 It is important to protect your RV from unexpected accidents, so why not protect it from mechanical breakdowns as well? To learn more about extended service contracts for RVs, you can visit the RV Warranty archives in our blog. If you would like to get a free quote on an RV warranty, click here. Happy RVing!